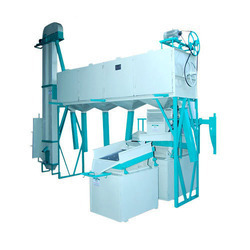 Leading Manufacturer of grain cleaning machine from Rajkot. We are the manufacturer of the Grain Cleaning Machine, known for its compact design, our manufactured cleaning machine is used by the wheat processing owners for cleaning various types of grains like wheat, bajra, sesame seeds and others. We provide standard as well as custom designed cleaning machines as per our client's requirements. Easy to use, they have an extremely low carbon footprint and are appreciated for their power-friendliness. Medium four sheet round separator attached with double destoner, blower & elevator.